The subject of the present article is entitled to be accepted as the giant of the equine world, and possibly no variety of English horse impresses foreign visitors to an agricultural show more than do the majestic animals which within the last few years have come to be included in the category of the Shire horse. Previously to a decision being arrived at amongst breeders to abandon such designations as Cart-horse and Agricultural horse, some confusion naturally existed in the minds of inexperienced persons who frequented horse shows as to the classification of our heavy breeds, and consequently the fusion of all heavy English horses - of accredited pedigree - save Suffolks, into one division has been welcomed by the public, and no doubt the animals themselves have been benefited by it. Accepting, therefore, the Shire horse as the modern representative of the English draught horse, the searcher after earlier records of his existence will at once discover that the variety possesses the distinction of being a very ancient one indeed. Sir Walter Gilbey, in his most interesting work on the old English War-horse, maintains, and with a very considerable amount of success, that the Shire is a direct descendant of that celebrated animal of which the ancient Britons were so proud, and their Roman conquerors were so extremely covetous. Still, whether Sir Walter Gilbey is fully justified in his deductions or not - and he writes with authority, since no one man has done more for the advancement of the Shire horse than he - the fact remains that there was an ancient breed of horses in Great Britain at the time of the Roman invasion, and that the animals were then considered remarkable for their size and power, though of course vastly inferior in stature to the Shire horse of the present day. There is no doubt at all, as history shows, that the old strain of horses was highly prized by successive kings of England who flourished since the Conquest, this fact being clearly proved by the references that have already been made to the good deeds, from a horse-breeder's point of view, of the different English monarchs. It is equally certain, also, that in the earlier stages of their respective efforts to improve their race of horses, the sovereigns of England were more influenced by a desire to produce a superior type of War-horse than to assist mere peaceable agriculturists in preparing their land for cultivation. As a matter of fact, all the necessary farm-work, which in those clays must have been terribly heavy, was performed for centuries by oxen, the few horses that were employed for what was considered to be a somewhat degrading task being known by the designation of stots or offers. A peculiarity in connection with the former of these titles is, that it is a term applied to oxen in certain parts of Scotland, and perhaps it points to the association of the old draught bullocks with horses used for farm-work. Plate XVII. HACKNEY STALLION, CONFIDENCE, D'OYLEY'S 153. By Prickwillow 614; dam by Highflyer 360 by Flying Buck 280. 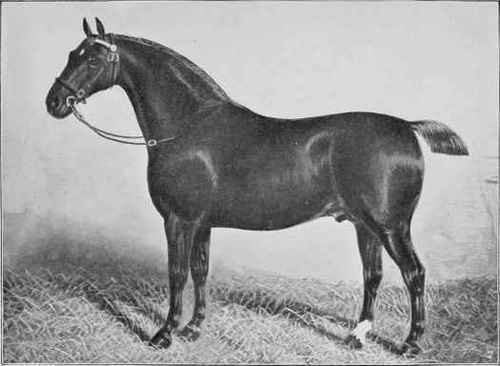 A famous hackney sire. HACKNEY STALLION, LORD DERBY 415. By Performer 459; dam by Joseph Andrews (Leake's). 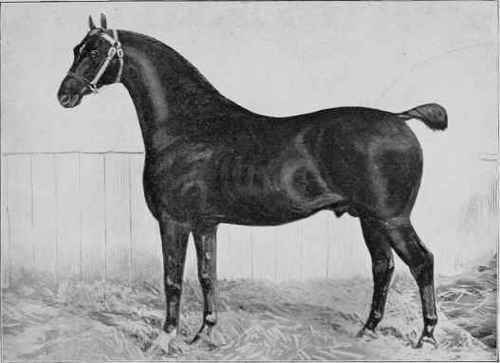 A famous hackney sire. William the Conqueror was the first king of England who attempted to produce a horse specially adapted for agricultural purposes; and so far as can be ascertained, the first notice of a horse being so employed was published in the first year of this sovereign's reign. It consisted of the delineation of a horse attached to a barrow and attended by a man. The figures were woven in a piece of Bayeux tapestry, which has served as a landmark to proclaim and fix an approximate date for the introduction of horses into the operations of the husbandmeii, and is therefore historically important. Henry II was the next monarch of England who appears to have made serious efforts to improve the race that was then known as "the Great Horse". In his reign sires were imported from abroad. John, whatever his other failings may have been, developed a genuine interest in horse-breeding, as evidence of which he imported one hundred large-sized stallions from Flanders and Holland for the purpose of crossing with the native mares. Edward II evidently possessed a hankering after both light and heavy horses, for he is credited with having imported thirty Lombardy war-horses and a dozen big draught stallions for breeding purposes; whilst Edward III, working on different lines, added his quota to the efforts of his predecessors by deciding to keep all the best animals in the country, which end he accomplished by prohibiting the exportation of any horses at all. Then there appears to have been a lull in the enthusiasm of the English kings in the matters of horse-breeding, until that monarch of decided views, Henry VIII, undertook to grapple seriously and practically with the question of undersized animals, though Henry VII may be credited with having attempted something by reviving the exportation laws. Bluff King Hal, however, when he once determined to see into the matter, lost no time in setting to work with characteristic energy. Only mares and stallions above a certain height were allowed to be bred from, and the wealthy prelates and nobles, whose wives indulged in such expensive luxuries as French hoods or velvet bonnets, were compelled to keep stallions of a stipulated size for the benefit of the community. Satisfied with the improvement that his earlier laws had effected in the race of English horses, King Henry, in 1535, caused another edict to be passed, which provided that all owners or farmers of parks and enclosed ground of the extent of 1 mile in compass should keep two mares apt and able to bear foals, of the altitude of 13 hands at least, under a penalty of forty shillings. A like penalty was also inflicted upon any owner or farmer who willingly permitted such mares to be served by a stallion under 14 hands. Still later on, in the year 1541, it was enacted that no horse under 15 hands should be allowed to run in certain forests and districts. This is specially interesting to the modern Shire horsebreeder, as the expression "Shire" is referred to in the Act - not, it is true, in connection with the animal, but with the districts in which stallions under 15 hands were to be permitted to run loose on moors and in forests. The districts were Norfolk, Suffolk, Essex, Cambridge, Huntingdon, Buckingham, Berkshire, Oxford, Worcester, Herefordshire, (doucester, Somerset, South Wales, Warwick, Northampton, Cheshire, Staffordshire, Shropshire, Leicester, Lincolnshire, Lancashire, Yorkshire, Kent, South Hampshire, and North Wiltshire. Not only were these stringent provisions made for ensuring the services of desirable stallions, but legislation was directed also towards mares, filly foals, and even geldings, which did not appear likely either to grow or to be able to bear foals of reasonable stature, or not likely to be able to do "profitable labours by the discretion of the drivers". 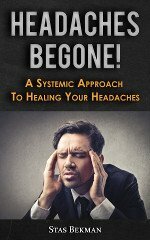 In such cases the driver or drivers were compelled by the Act to cause the unprofitable beasts to be killed, and their bodies to be buried in the ground or "otherwise bestowed as no annoyance thereby shall come or grow to the people there near inhabiting or thither resorting". Subsequently, the laws already in existence prohibiting the exportation of horses were extended to Scotland, so that any person discovered selling horses to a Scotsman, and the purchaser as well, rendered themselves guilty of the act of felony. That the vigorous policy of King Henry worked well there can be little doubt - a statement made by Sir Thomas Chaloner in the reign of Queen Elizabeth, assists to prove this - for there is every reason to suppose that his subjects, knowing the determined disposition of their monarch, and his peculiar methods of enforcing obedience to his will, acted up to the strict letter of the law in every particular. Finally, it may be added as a testimony to King Henry's sincerity in his desire to improve the heavy horse, that Ralph Holinshed states that he "erected a noble studderie for breeding horses, especially the greatest sort, and for a time had verie good success with them".